License and Permit bonds are required by many federal, state, or municipal government in order to receive a license or permit to conduct different types of business activities. These types of bonds operate as a guaranty from a Surety Company to government agencies and their constituents, known as the Obligee, that the Principal, Company will do business in compliance to municipal ordinances and regulations or state law. These types of bonds include, contractor’s license bonds, which assure that a contractor (general contractor, sub-contractor, plumber, electrician, etc) complies with laws relating to his field of expertise. Also included are Broker’s bonds, including Insurance, Mortgage, and Title Agency bonds, Customs bonds, Tax bonds, Motor Vehicle Dealer bonds and many others. Court Bonds are ordered by statute and relate to the courts. They include Appeal bonds, Supersedeas bonds, attachment bonds, replevin bonds, injunction bonds and Mechanic's lien bonds. 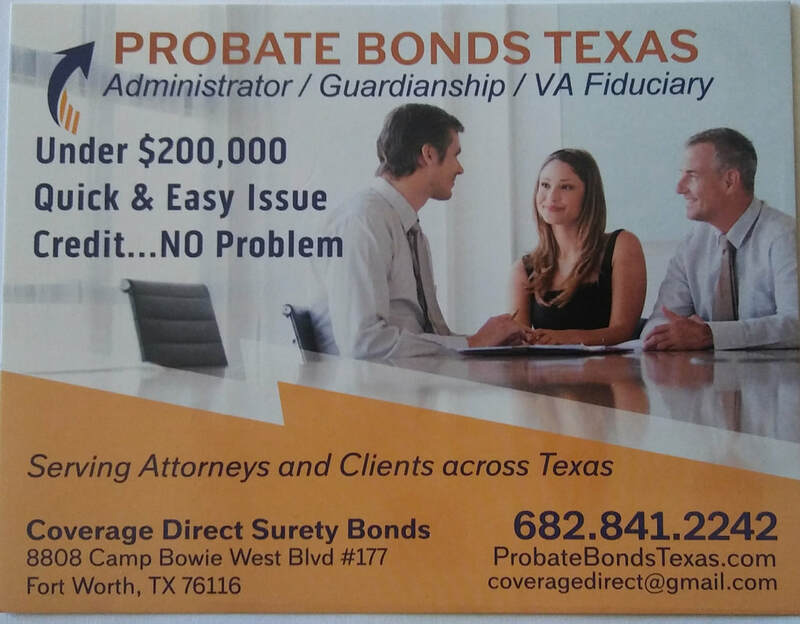 Fiduciary, or probate, bonds are filed in probate courts and courts that exercise equitable jurisdiction; they guaranty that those who the courts have entrusted with the care of other persons property will perform their specific duties faithfully. These bonds include administrator, guardian, and trustee bonds. Public Official Bonds guaranty the faithful and honesty performance of people elected or appointed to positions of public trust. Officials sometimes requiring bonds include: Notaries, Treasurers, Commissioners, Judges, City Clerks, Police officers, and Credit Union volunteers. Miscellaneous bonds are bonds that might not fit in the other commercial surety bond classifications. They often support private relationships and unique business needs. Hazardous waste removal bonds, lost securities bonds, credit enhancement financial guaranty bonds, self–insured workers compensation guaranty bonds, and wage and welfare-fringe benefit bonds or Union bonds are great examples of these types of bonds.